First Lenovo Android Notebook is here! Lenovo A10 is an Android Notebook, a factor form that may be a bit awkward to introduce in the reign of Android devices. Why would anyone jump into an Android Notebook when there are plenty Android tablets with add-on keyboards that may do the trick with the added liberty of detaching the keyboard… Anyway, here it is, the first Lenovo branded Android Notebook, with serious specs -but nothing to be impressed about-. 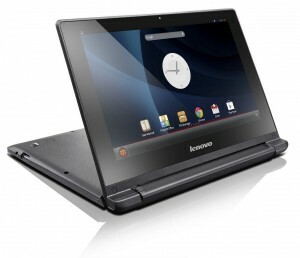 Lenovo is known for their quality notebooks and PC so we might expect at least a robust Android Notebook. But then, given that this is a notebook, at least then you may be thinking: They surely attached the keyboard in a 360 degrees or even clamshell configuration, so I can get it on my desk as a traditional notebook, or eventually give the screen a spin and use it one handed, tablet like … but then a gain, nope. The screen / keyboard hinges go about 300 degrees at its max aperture. You may end up with your screen up like in the picture attached to this article, but that is it. A nice battery system -there is lot of space below that keyboard for it- gives this notebook about 9 hours of usage (nothing that impressive, tho). Inside the Lenovo A10 we find a rather humble processor, an A9 ARM running at 1.6 Ghz. The Lenovo A10 includes 1 gigabyte of ram and 16 gb of integrated storage (again, nothing out of this world) and the LCD screen is just 10.1 inches. The Android notebook runs Android 4.2 Jelly bean (not that bad!). The whole system weights about one kilogram.